SPENCER – The N.C. Transportation Museum Foundation and the Watauga Valley Chapter of the National Railroad Historical Society will host day trip train excursions to Roanoke, Va. October 30 and Asheville, N.C. October 31. These excursions, now in their fourth year, allow travelers to see beautiful fall foliage, experience a great destination and enjoy the romance of riding the rails. 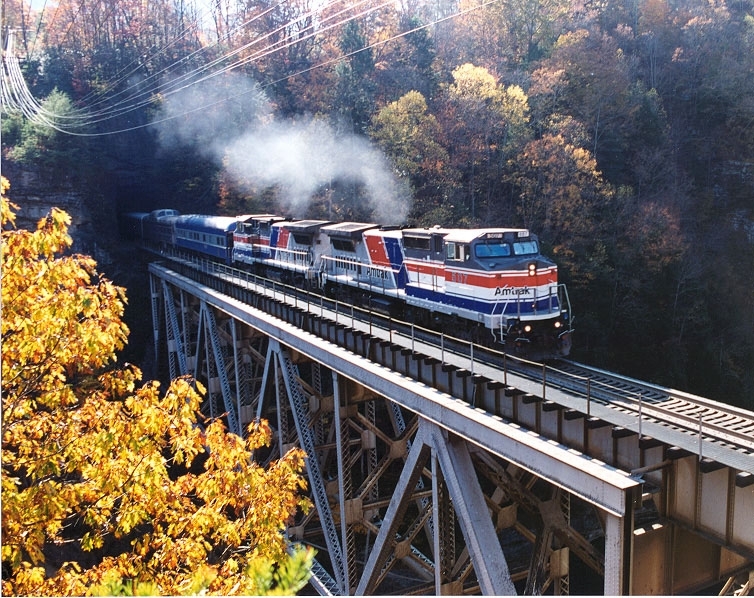 The N.C. Transportation Museum and Watauga Valley NRHS revived fall excursions in 2007, offering trips to Charlottesville, Va. Sell out crowds and satisfied passengers made those excursions incredibly popular. Last year’s addition of Asheville, N.C. as a destination created an even greater demand for tickets. The trips sold out in record time, with dome car tickets selling out in mere minutes. This year, the “Virginia Autumn Special” will travel to Roanoke, Va. Saturday, Oct. 30. The “Blue Ridge Special” will travel to Asheville, N.C. Sunday, Oct. 31. More dome car tickets have been added but the demand is expected to be just as strong as years past. Departing Spencer at 7 a.m., Saturday’s Virginia Autumn Special” will offer additional passenger pick-up at the Greensboro Amtrak Station at 8 a.m., allowing those in the Triad a more convenient boarding opportunity. The train will travel through the northern portion of the North Carolina Piedmont, including the cities of High Point and Reidsville before crossing into Virginia. The western part of central Virginia offers spectacular views of the fall foliage, crossing the Dan and Roanoke Rivers. Moving onto the old Virginian Railway line, passengers will travel westward, passing through several tunnels and enjoying the rolling Virginia countryside. The train will arrive in Roanoke, the “Star City of the South,” at noon. Passengers will have nearly three hours to enjoy the attractions offered. Downtown Roanoke offers an array of dining experiences, shopping and sightseeing opportunities. Passengers will depart the train at the old Norfolk and Western Passenger Station, home of the O. Winston Link museum. The museum offers a grand photographic and auditory history of 1950’s steam engine locomotive history. Advance tickets to the museum are available to excursion passengers at the discounted group rate of $4 per person. The nearby Taubman Museum of Art features a permanent collection of 19th and early 20th Century American art, while the Historic Roanoke City Market has fresh food and handmade crafts. Passengers can also take a drink from the historic Dogmouth Fountain, constructed in 1898. Legend says those drinking from the fountain will always return to Roanoke. Departing Roanoke at 3 p.m., the train will arrive back in Greensboro at 6:45 p.m. and Spencer at 8 p.m.
During Sunday’s trip, the “Blue Ridge Special” will travel through the western Piedmont into the foothills and on to the Blue Ridge Mountains. Departing Spencer at 7 a.m., the train will roll through the cities of Statesville, Hickory, Morganton, Marion, Black Mountain and Swannanoa. The train will climb the famed “loops” of the Blue Ridge Mountains and pass through several tunnels before arriving in Asheville at noon. Passengers will have nearly three hours for an outing at Biltmore Village. Established in the late 1890s as a planned community near the entrance of the Biltmore estate, Biltmore Village stands near the entrance to Biltmore Estate. Shopping will be available in unique, locally-owned boutiques. Passengers can dine in restaurants and take walks along brick sidewalks that parallel tree lined streets. All of this will be enjoyed alongside spectacular views of the North Carolina mountains. Departing Asheville at 3 p.m., the “Blue Ridge Special” will return to Spencer at 8 p.m.
Dome Tickets offer the best views of passing scenery with two levels. Windows stretch across the walls and ceiling on the second level, providing a panoramic view of the entire ride. Dome tickets are available for $280 per person. Premium First Class fare includes continental breakfast and newspapers on the journey to both Roanoke and Asheville, plus dinner on the return trip served in vintage lounge and dining cars. Premium First Class tickets are available for $245 per person. Deluxe Coach Class tickets feature spacious seating with large windows, lunch on the dining car and light snacks during the trip. Deluxe Coach tickets are $175 per person. Coach seating, featuring wide windows, adjustable seats and convenient access to the commissary car, are also available for $145 per person. All cars feature air conditioning, heat and rest rooms. For those wishing to eat on the train to provide more time for sightseeing, an optional box lunch will be offered. The $14 meal, served in a souvenir lunch tote, includes include a half turkey wrap, pasta, chips & salsa, a cookie and drink. Tickets will be available online at www.nctrans.org or by calling 704-636-2889 ext. 232. Tickets go on sale at 10 a.m. Wednesday, June 24. The N.C. Transportation Museum, located in historic Spencer Shops, the former Southern Railway repair facility is located just five minutes off I-85 at Exit 79 in Spencer, N.C., and about an hour from Charlotte, Greensboro or Winston-Salem. The museum is part of the Division of Historic Sites and the N.C. Department of Cultural Resources, the state agency with the mission to enrich lives and communities and the vision to harness the state’s cultural resources to build North Carolina’s social, cultural and economic future. Visit http://www.nctrans.org for more information. For information on the Watauga Valley Chapter of the National Railway Historical Society, visit www.wataugavalleynrhs.org. NC Transportation Museum: Rail Days This Weekend! 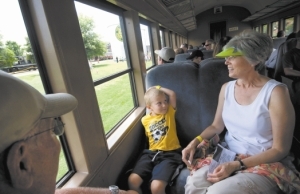 The N.C. Transportation Museum’s 2010 Family Rail Days Festival this weekend will celebrate the golden age of railroading and offer something for every member of the family. Featuring historic locomotives and rail cars displayed alongside modern rail equipment, the event will give visitors a chance to enjoy train rides, great music, model train layouts and a model train expo. This year’s Family Rail Days will be held in association with 2nd Saturdays, a partnership between State Historic Sites and the N.C. Arts Council. Artists will be given the opportunity to show and sell their work June 12. Poetry, music, painting, drawing, photography and more will be offered. 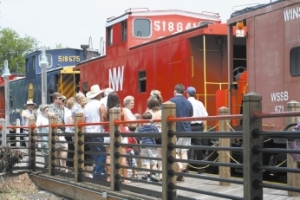 Visitors to the 2010 Family Rail Days Festival will have numerous chances to ride the rails. Boarding at the pedestrian crossing, the passenger train will offer a 25 minute ride around the museum property on classic rail cars pulled by vintage diesel locomotives. The caboose train, boarding at the Barber Junction Visitor’s Center, gives everyone a chance to ride in their favorite train car. At the Roundhouse, motor car rides will be offered, giving visitors a chance to ride these smaller pieces of rail equipment used to repair tracks. An up-close view of the N.C. Transportation Museum’s classic steam and diesel locomotives will be available during the Parade of Power. Engines are placed on the Roundhouse turntable for great photo opportunities. The Parade of Power takes place at 11 a.m. and 2 p.m. both Saturday and Sunday. Turntable rides will be offered throughout the Rail Days festival. Families can take a spin and get a closer look at how the Spencer Shops operated during the good ol’ days. SPENCER — Roy Johnson, president of the N.C. Transportation Museum Foundation, is looking ahead to a bright new year. Under his leadership, the organization is making changes to protect itself, and is thriving despite a down economy. “We’re trying to tell the full story of how transportation developed North Carolina,” he said. The N.C. Transportation Museum Foundation provides fundraising and political advocacy for the 57-acre museum. In particular, the foundation has helped acquire millions of dollars in historic artifacts for the museum. Johnson, a Charlotte-based architect, has been president of the foundation since June. Under his tenure, the museum has weathered continued fiscal belt-tightening by the state of North Carolina, and has seen visitors to the Spencer museum it supports increase by 15 percent. SPENCER — He’s making a list, and checking it twice, but not on a sleigh with snow and ice. Santa Claus is taking the train to town. With festive decorations aboard, the Santa Train’s been running at the N.C. Transportation Museum for the last two weekends. Santa and his elves board to pass out treats and talk to each child and family. “You kids stay sweet and smart,” Santa Claus said to Chloe and Cameron Mullinax of Mount Pleasant. Their mom, Christy Mullinax, has been bringing her daughters to Spencer for the Santa Train for years. Chloe, who’s 3 years old this Christmas, smiled while one of the volunteers took her picture with Santa, her sister and her mom. “A DVD player that sits on your lap and a (Nintendo) DSi,” she said, among other things. “You think he’s got enough time to get all that together?” Christy asked with a smile. Families from as far off as Shelby and Winston-Salem were among the riders sharing wishes with Santa yesterday afternoon. NC Transportation Museum’s Santa Train! Tickets only available on the day of the event. Meet Santa Claus as he trades his sleigh for a locomotive! 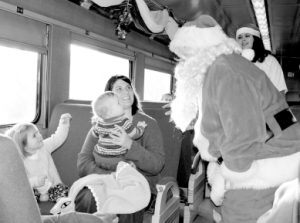 Take a 25-minute train ride with Santa and his elves, as Santa hands out oranges and candy canes, a Southern Railway tradition. Children will hear classic Christmas tales and have fun making holiday ornaments in the Roundhouse. CLICK HERE FOR MORE INFO AND TO WATCH SANTA TRAIN VIDEO! length of the train ride are free, and do not need a ticket to ride the train. CLICK HERE to find our how to have cookies and cocoa with Santa! SPENCER, N.C. – More than 400 Boy Scouts will spend a busy and fun-filled weekend at the N.C. Transportation Museum during Rail Camp, Nov. 6-8. Troops will spend Friday through Sunday at the museum, the site of the former Spencer Shops steam locomotive repair facility. Most of the 28 troops attending this year’s Rail Camp come from North Carolina. However, troops will also be traveling from as far north as Danville, Va. and as far south as Anderson, S.C. All will learn about locomotive travel and rail transportation and earn their Railroading Merit Badge.